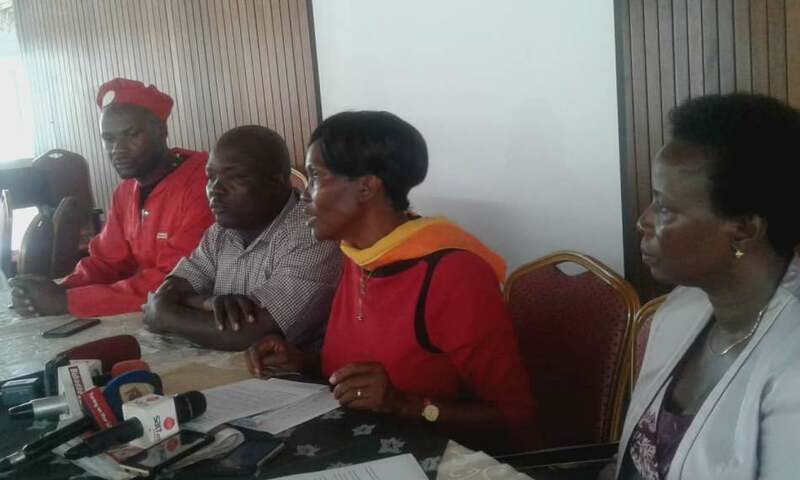 KAMPALA– Parliamentary Workers’ committee has called for the immediate compensation of journalists that were recently assaulted by security forces while covering riots that rocked the city, when locals got rowdy demanding for the immediate release of detained Legislators. The group led by Margaret Rwabushaija and Agnes Kunihira, were accompanied by Mbwatekamwa Gafa (Kasambya County) and David Abala (Ngora County) lashed out at security agencies for the highhandedness they used while arresting journalists who were covering the riots, saying the army should not only stop at apologizing to journalists, but rather compensate the brutalized ones. While addressing journalists at Parliament, Rwabushaija explained that members of the fourth estate are professional workers, just like any other workers, so there is no reason to have them beaten and destroying their equipment, saying such actions expose them to unnecessary job hazards. “We watched with dismay the brutal manner in which our security forces have descended on our members such as James Akena (Reuters), Herbert Zziwa (NTV), Ronald Galiwango (NTV)among others and bettered them senselessly while covering the recent riots in the city and Arua arising out of the arrest of Members of Parliament,”said Rwabushaija. On justifying their stand, Rwanashaija noted that journalists belong to the Trade Union Movement, therefore it is the duty of their elected representatives in Parliament to protect and promote a healthy and secure environment to enable them conduct their duties. “Journalists are not the cause of the riots and brutalizing them will not solve the underlying causes of the riots in the country; we wish to call upon government to address the root cause of the disturbances,” she said. On the other hand, Kunihira said that despite the fact that Uganda People’s Defence Forces (UPDF) has apologized on behalf of its officers that tortured the journalists, the apologies will not wash away the humiliation the journalists faced and they is need to get their apology a notch higher by offering the affected journalists medical treatment as well as replace the equipment that was destroyed during the scuffle. “We appeal to all concerned parties that together we continue to work towards a stable democratic, peaceful and secure country in which human rights are respected and harmony and peace prevails,” Kunihira said.